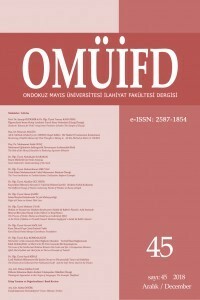 Ondokuz Mayıs Unıversity Review of the Faculty of Divinity (OMUIFD) is an international peer-reviewed academic journal puslished twice a year, in June and December. The journal aims to publish scientific research articles, book reviews, scientific meeting and symposium reviews in the field of Islamic Studies (Scope: Arts and Humanities/Religion/Islamic Studies & Scope: Social and Behavioral Sciences/ Theology and Ethics) and to share these studies with public. The journal does not have any article submission charges or article processing charges (APCs). OMUIFD uses double-blind peer review process and all articles are checked by means of a software in order to confirm they are not published before and to avoid plagiarism. Dergimize nasıl makale gönderebileceğinizi gösteren eğitim videosu için tıklayınız.